Who Will Step Next On the Lunar Surface? When Neil Armstrong took that slow first step off of the Eagle and onto the moon, there has always been a bit of controversy over what he said. See 4:50 in the video. “That’s one small step for man, one giant leap for mankind.” That’s what I, a 10-year-old boy, probably with my mouth hanging wide open as I sat astonished on the carpet of my living room at 735 7th Avenue South in Clinton, Iowa, staring at the 13-inch black-and-white screen of the family TV, heard. As did 500 million of my closest friends who were also watching, worldwide. I’m inclined, even as an eye-witness via TV, to give him a benefit of the doubt. Now, Neil Armstrong has taken that final step that all of us must at some point, and has crossed that line that we all wonder at a bit. NASA image. 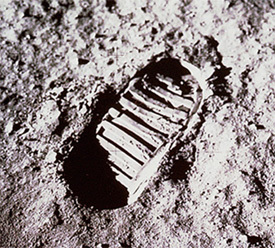 Footprint on the moon. The first man on the moon is permanently out there somewhere. If, in heaven or hell, we are allowed or doomed to repeat some salient moment of our life, perhaps he is on an airless, dusty planet close to his home Earth, planting his foot. The moon has long fascinated humans. We see a man in it, or some other human—in “To Kill a Mockingbird,” Scout saw a woman sitting at a mirror. The very first mass medium on the planet was published in the 1840s in New York City—The Sun, the first “penny press” newspaper for the common person, reported that scientists had found a race of flying “men” on the moon. 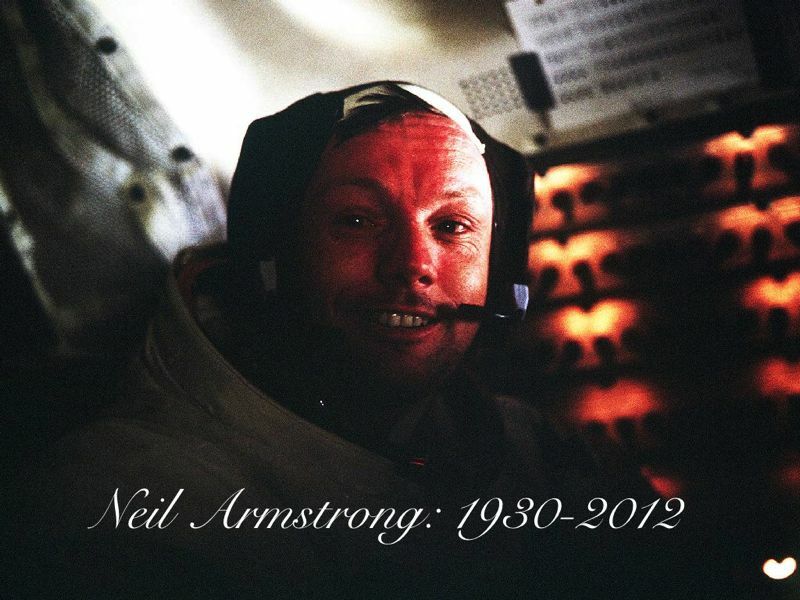 Well, the first flying man on the moon turned out to be Neil. The moon suffers a bit from bad PR. In astronomy, a planet is a large, round object in a more-or-less regular orbit that is big enough and has enough gravity to sweep debris from its orbit and thus dominate it’s space. As it turns out, Pluto lacked the oomph to be a planet. Poor Luna. Absent Terra, she would have it made. For most planets, if they have a moon or moons, there is a huge differential—the moons are definitely secondary objects in that area of the sky. Not so Luna. She’s not so small, compared to us—in fact her odd orbital pattern of having her day match her orbit around us suggests that Earth was once bigger and something split us before we cooled and solidified. Our moon is really more a twin planet than a regular moon usually is, and our moon seems a piece of Earth. She’s heavier than Mercury. At least, that’s what I recall from sixth grade science. I haven’t kept up on astronomy that much, and don’t know what the latest thinking is of our twin’s origin or all of the details about her. Let scientists be scientists and writers be writers, but let writers remember that scientists establish the facts we write about. Anyway, twin planet or “our” moon, she is there and we are here and Neil was there. My niece posted on Facebook that, with Neil’s death, we are getting close to the point where no living human will have set foot on the moon. In 1969, that seemed impossible. We expected a lunar colony in a generation, and then to go on and to explore the universe. And yet, we have not met those expectations, and that’s a shame. Of all the wacky, crazy things Newt Gingrich said when Puff Daddy the Marshmallow Man was running for Prez, the least wacky was calling for a base on the moon. I am not competent enough to judge all of the cost-benefit tradeoffs, but I can recognize that a nearby airless planet should come in handy for studying our skies, and we do have lots of good reasons for studying those skies and precious few good ones for failing to do so. But, we’ll call the base “Armstrong.” “Newt” can be the dining hall. We miss you, Neil. We miss your kind. Your tribe of space explorers should be growing, not dying off. NASA home page image, NASA.gov. 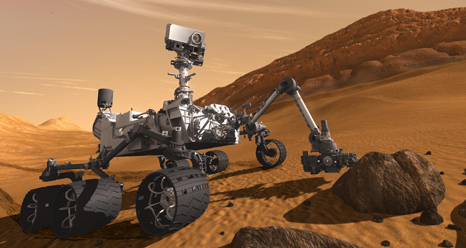 From NASA web site, artist’s image of Curiosity rover on Martian surface. May it be so. The NASA web site provides a countdown, and as of this writing, it’s under four hours until we find out if Curiosity gets to the red planet or Mars kills Curiosity. Here’s hoping all goes well. Mars is now like Iowa in summer 2012—devoid of water. Well, sure, the drought on Mars has gone on for a few million years more, and the corn there looks even worse, by a bit. But, in this arid summer of 2012, it’s great that humans are (knock on wood) landing another rover on Mars. Our curiosity about our own universe is a positive thing—and one of the few public policy areas where I very much disagree with the Obama administration. Sure, many government belts ought to be tightened. But not the one that fuels basic scientific research and tells us about ourselves. NASA ought not be starved for funds, even in a recession. And I worry what might happen if Curiosity crashes. The billions spent on sending the rover were not a “waste,” even in that case, because space exploration requires some costly gambles. Anyway, I hope, dear readers, by the time most of you see this, that the first images from Curiosity are being posted by NASA. Back on Planet Earth, Iowa got some much needed rain Saturday. About two inches fell, the first significant rain since May. The blessing was not unmixed—high winds at one point left 16,000 people in Cedar Rapids in the dark when tumbling trees severed power lines—but we’ll take the rain and wish for more. In my gardens, there are some plants hanging on and others suffering. I fear I may lose some ferns—we had a nice patch peeking through our rock retaining wall, but most of the wall ferns are withered and brown. Even some “in-ground” ferns are looking sick or dead, despite the watering I’ve been doing in the garden. Today, after the rain, a few of the “dead” ones are sending up new growth, so there is hope as long as the 100-degree arid days don’t stretch on again. Astilbe is suffering, and some clumps have died. Hydrangea are dropping, and the largest of these bushes, on the northwest corner of the house, has more dead than live parts (but may survive, since a bush may come back if any of it lives). The crab apples in front are panting for water and slowly retreating. The older ones in back are tougher, but still don’t look happy. Most Hostas are OK, but a few, even in shady areas, look sunburned. And then there are the baby trees. I had some Catalpa started from seeds, most of which have expired (not the transplant from Mimi’s yard, however, which is going strong). I planted seven Arbor Day Foundation trees this spring (in a pack of ten, three died over the winter), and three are OK, one is barely hanging on, one has lost all its leaves but seems to be trying to come back, and two seem to be just about knocking on heaven’s door. Well, all in all, it felt a bit odd today to mow. I have not done that in more than a month—this is the first July in my memory where it was so dry all month long that the grass didn’t grow and didn’t have to be mowed. It was a big chore because I had to rake six weeks worth of fallen sticks and an unusual covering of mid-summer leaves from the yard before the mow. I can only hope that August might bring a few more mows. And some good news from our arid red neighbor. Even if I am fretting about my not-wet garden, I’m also thinking of you, Curiosity. New York Times story describes the challenge well, too.